After a calorie-torching ski or snowboard session, there’s nothing more satisfying than a lavish lunch or decadent dinner. Here’s an insider’s guide to the most mouth-watering local comfort food in Banff & Lake Louise – it’s sure to get your tastebuds dancing and your legs energised for the next powder day. You're spoiled for choice for decadent dining options in Banff & Lake Louise. Photo by Paul Zizka at The Block Kitchen + Bar, Banff. 1. Located right at the base of Mt Norquay ski resort sits Cascade Lodge, the best place to watch the sun go down behind the mountains. Upstairs, the Lone Pine Pub is the place to be for an après drink and relaxing slope-side meal. With a fresh new menu for the 2016/17, there’s plenty of deliciously innovative new meals to to sample. Insider picks: enjoy the selection of huge, hearty salads with plentiful toppings, or a for something more indulgent, opt for jalapeno shrimp gorditas or bao chinese steamed buns with pork belly. Bonus: spectacular mountain views. 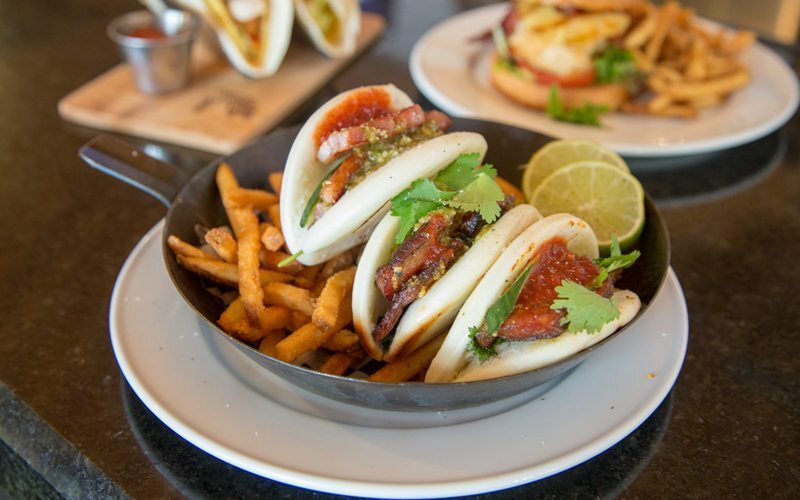 The bao Chinese steamed buns with pork belly at Mt Norquay's Lone Pine Pub are sure to impress. Photo: Dan Evans. 2. Kuma Yama Ramen + Sushi Bar has quickly established itself as a stand-out lunch destination at The Lake Louise Ski Resort. Nestled within the Lodge of the Ten Peaks at the resort’s base, a lunch visit is the perfect complement to a long carving session on the hill. 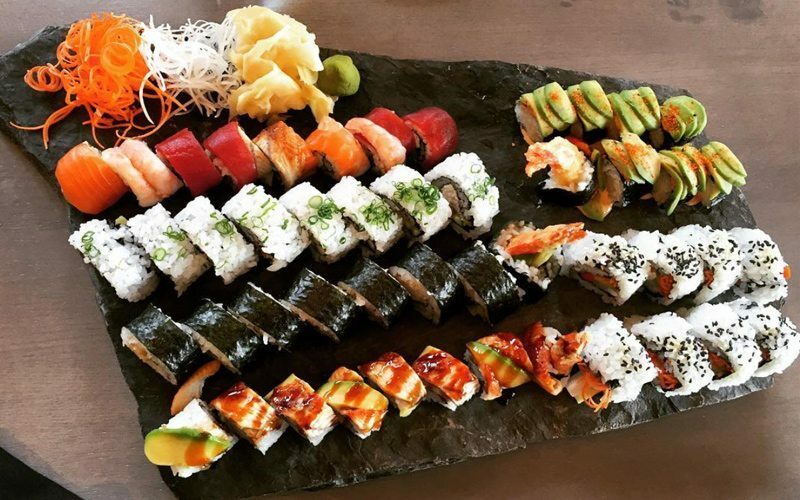 Sushi is served on rustic stone slabs for a nice alpine-themed touch. Insider pick: choose from tataki, nigiri, sashimi, ramen or custom maki rolls designed and named after the resort’s world-famous runs and terrain. Kuma Yama is a great choice for a satisfying slope-side lunch at Lake Louise Ski Resort. Photo: @nikkipaterson4 on Instagram. 3. A skiing or snowboarding adventure at Sunshine Village is not complete without a visit to Mad Trapper’s Grill & BBQ. Located in the Old Sunshine Lodge and established in 1928, Trapper’s walls are lined with intriguing pictures and artefacts from years gone by. Insider picks: specialties include Applewood-smoked meats and southwestern dishes. Be sure to try the surprisingly satisfying deep fried pickles! Fun fact: the pickles were briefly removed from the menu in 2015, however, following an outpouring of community support for their return (including a dedicated hashtag: #LongLivetheSunshinePickle), this hugely popular side dish was swiftly reinstated. 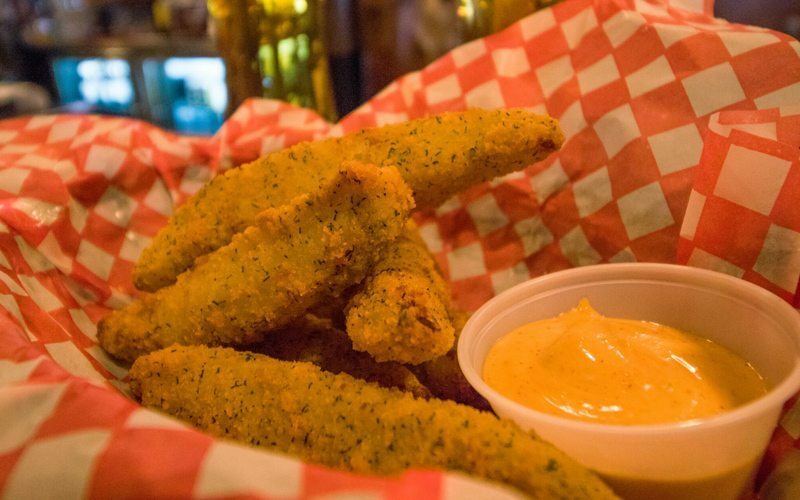 A visit to Sunshine Village isn't complete without sampling the famous deep fried pickles at Mad Trapper's Grill & BBQ. Photo: Sunshine Village. 4. 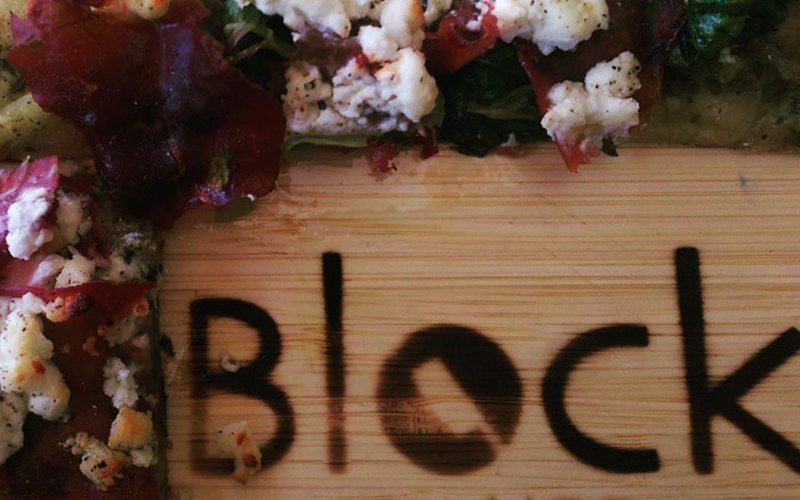 For ‘Mediterr-Asian’ fare, fresh local ingredients and bold flavours, a visit to The Block Kitchen & Bar is a must-do. Stand-out food and a cozy, inviting atmosphere garner consistently outstanding reviews for this local favourite. Tip: being a smaller establishment, it’s a good idea to make a reservation in advance to avoid disappointment. Insider pick: try the smoked bison flatbread with arugula, caramelized onions and feta. Smoked bison flatbread with arugula, caramelized onions and feta is a popular choice at The Block Kitchen + Bar. Photo: @offtheeatentrack on Instagram. 5. Rediscover the taste for la dolce vita at Castello Ristorante. 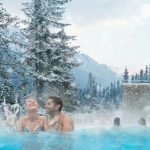 Nestled within the fairy tale castle-esque Fairmont Banff Springs, this upscale and authentic Italian favourite will take you to another world of decadence and comfort. 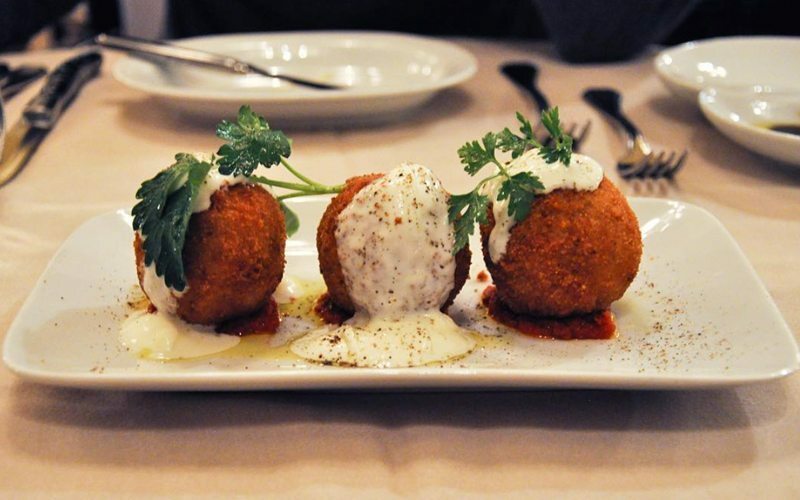 Insider picks: don’t miss the crab risotto arancini and arguably the best spaghetti and meatballs in Banff National Park. Crab risotto arancini is a firm favourite at Castello Ristorante at the Fairmont Banff Springs. Photo: @risubaby on Instagram. 6. While Alberta may be known for its meat, vegetarians and vegans won’t be left out in the cold at local plant-based paradise Nourish Bistro. This gourmet vegetarian comfort food will please even the most die-hard omnivore. Insider picks: be sure to sample the award-winning signature dish: 27-ingredient nachos (including strawberries and other unexpectedly savory-compatible fruits). Other stand-outs include the hickory-maple baked poutine, and mac ‘n’ squeeze made with gnocchi and vegan cheese. 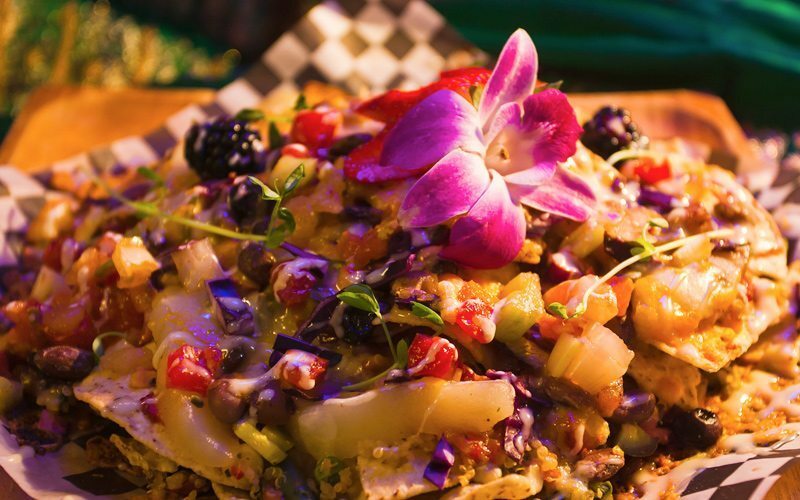 Nourish Bistro's award-winning 27-ingredient nachos are something special that you won't find anywhere else. Photo: Nourish Bistro. 7. In need of a hearty feed after a jam-packed ski day? 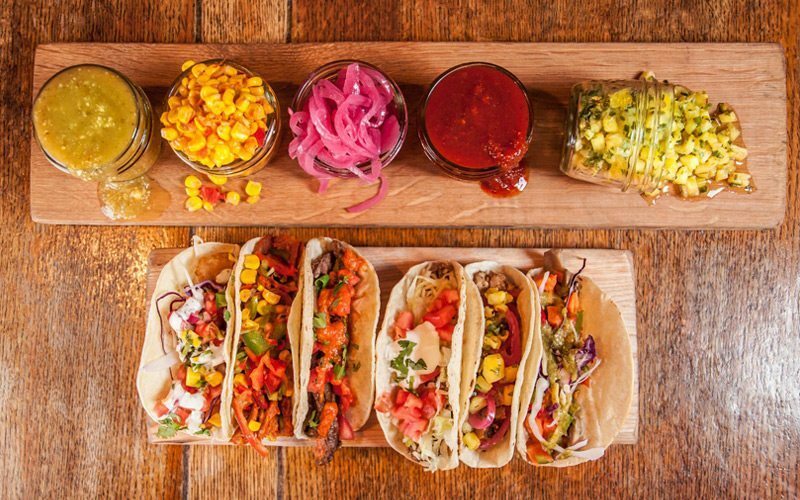 Look no further than long-term local favourite Mexican eatery Magpie and Stump. Insider pick: the mouth-watering chorizo taco or burrito is a stand-out choice that will reinvigorate you for Day 2 on the ski hill. Magpie and Stump is an excellent choice for great Mexican food in Banff. Photo: Magpie and Stump. 8. 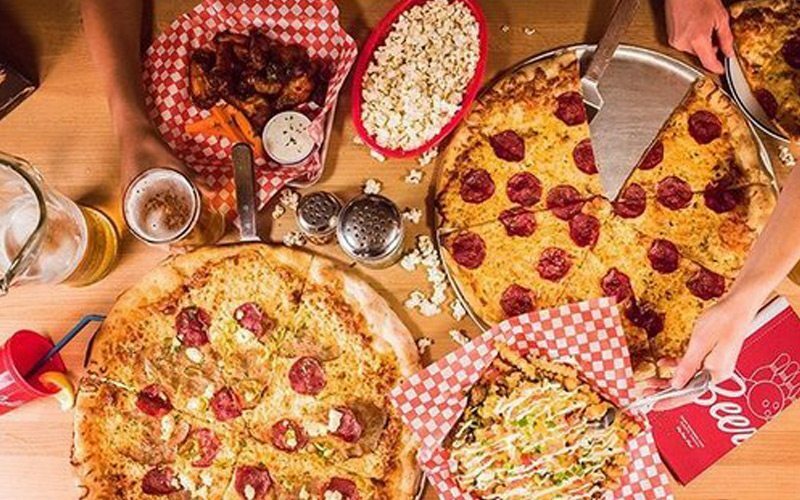 If you’re partial to a great pizza, you’ll feel right at home at High Rollers, Banff’s newest bowling alley which specializes in pins, pints and pizzas. It’s the perfect spot to grab a pizza (arguably the best in Banff), test out your ten-pin skills and enjoy one of the 48 beers on tap. The bowling lanes feature comfortable booths for eating and drinking while you play – but the food is worth the visit regardless of whether you’re smashing pins. Insider picks: try the Canadian pizza (they bring you a bottle of maple syrup to drizzle on top) and almost-a-meal-in-itself gutter ball garlic bread. Tip: visit on a Sunday for the best specials. High Rollers has you covered for pins, pints and pizzas. Photo: High Rollers. 9. They say to find the best food you must go where the locals go. And Banff locals looking for a cheap and cheerful feed go to Chaya – a hidden gem specialising in great Asian fare. Don’t let the no-frills aesthetic fool you – this no-fuss comfort food really hits the spot. 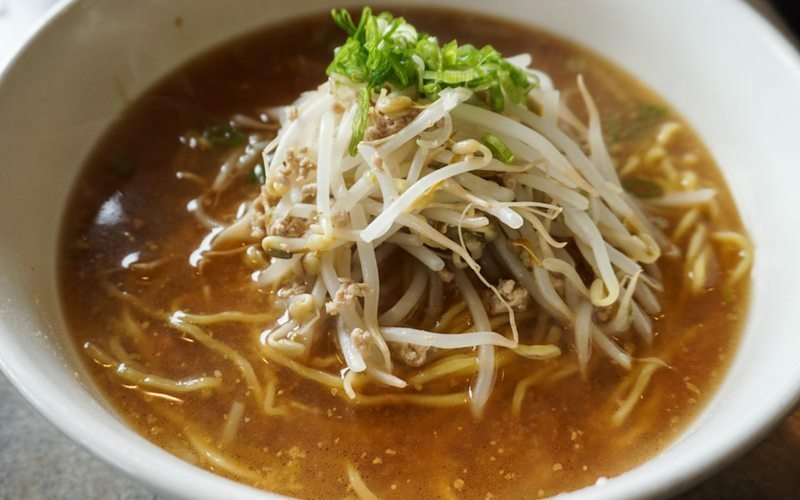 Insider picks: the hot and hearty ramen causes a line-up for a reason. 10. Laggan’s Mountain Bakery & Delicatessen is a wonderful quick service restaurant, deli and bakery offering hot drinks and delicious meals made from scratch. It’s Lake Louise’s pastry paradise. Insider pick: three words – pepperoni pizza bagel. 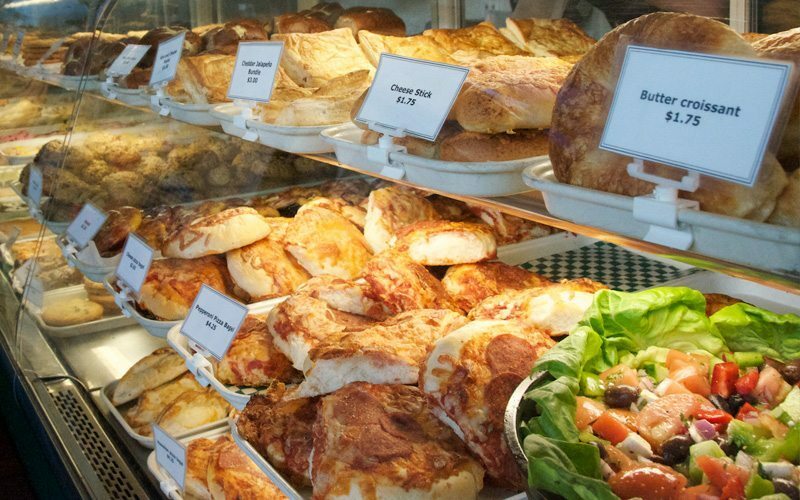 Laggan's Mountain Bakery & Delicatessen is a quick and easy option for something delicious. Photo: Laggan's. 11. A visit to Banff National Park isn’t complete without a visit to the magnificent Fairmont Chateau Lake Louise, and by extension, the upscale Walliser Stube Restaurant & Wine Bar. Here you can enjoy a tempting variety of classic European alpine dishes influenced by regional styles, or indulge in the extensive line-up of Alpine beer – you’ll be spoiled for choice with the floor-to-ceiling wine library which houses more than 500 bottles to choose from. Insider pick: for a truly decadent dinner, savour the famously authentic Swiss cheese fondue. 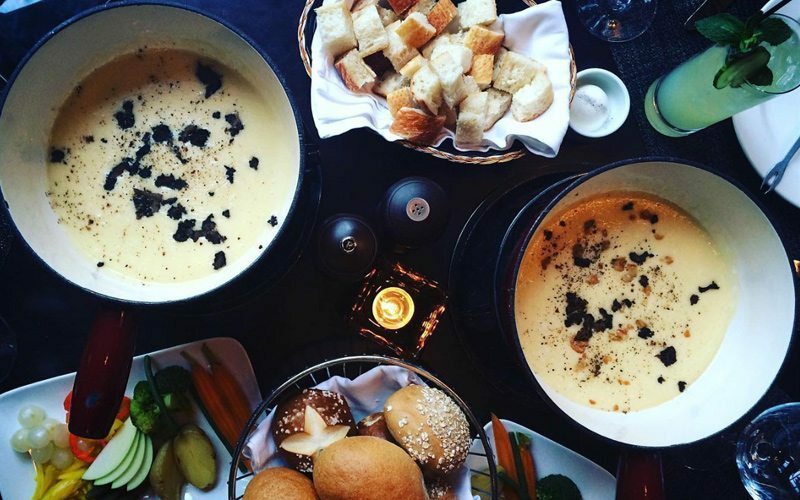 Walliser Stube's cheese fondue is the perfect way to indulge at Fairmont Chateau Lake Louise. Photo: @vickiarkoff on Instagram. 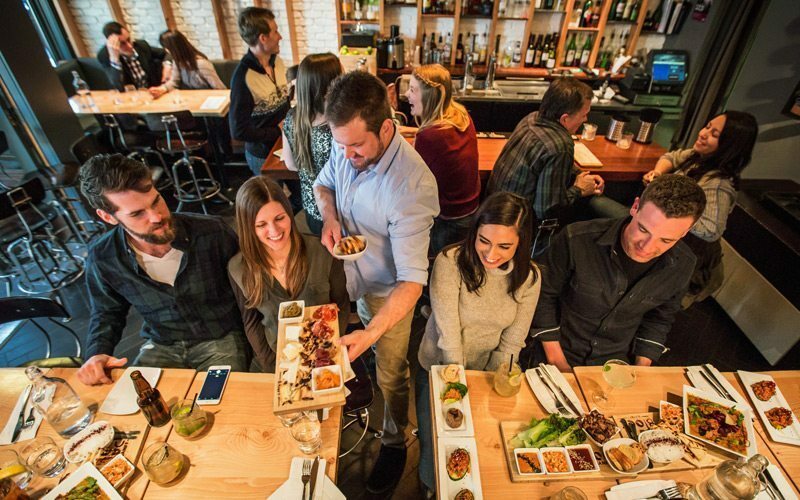 Insider tip: If you’re lucky enough to be in Banff between January 18-22, 2017, be sure to sip, savour and enjoy the impressive local food scene during Banff’s Big Taste. The big drawcard is a Grand Tasting Hall at the magnificent Fairmont Banff Springs, but fun events like the Pins & Pints Bowl-Off, Alberta Whisky Seminar and Banff’s Best Chef competition will keep you busy throughout these tastebud-tingling five days. Hashtag #SkiBig3 for your chance to be featured on our social media accounts! Are you ready for a vacation to remember? 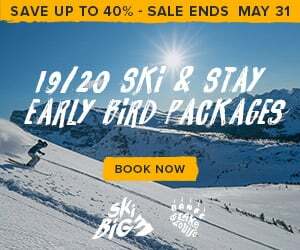 To book your next ski vacation at Ski Banff-Lake Louise-Sunshine, check out our featured ski and stay vacation packages or call us at 1-844-754-2443.